Tales from Bloggeritaville: Thrifty Thursday #125, Plus a Tablescape! Thrifty Thursday #125, Plus a Tablescape! Hi! It's Thrifty Thursday! I am your host, Leigh. Thank you so much for stopping by and additional thanks to those who also participate in Thrifty Thursday! I am most delighted to have you join in..for it's YOU who makes it a "show and tell party". It's a mirror I have actually had for years. I found it close to 10 years ago at Kirkland's in the "Green Corner". If you look closely, you might notice the frame was a little warped, kinda like me, so it came home and was admired for many years for it's odd and warped frame. The design was rabbits. They were dimensional, 2-D. I mention this for a reason, which I explain in a moment. I am a fortunate person. I am able to get to the beach pretty often. On many occasions when I visit, I love to comb the beach for driftwood. Its so therapeutic and relaxing. It empties my mind in a positive way. I stroll, collecting as I go, putting driftwood in my big beach bag. I like to then take my driftwood finds and haul them all home, knowing I will do "SOMETHING" with them. Much to my husband's dislike. It's an ongoing disagreement, "Why do we have to bring a bunch of sticks home? We have sticks in our yard!!! And it takes up trunk space." Ah, the precious trunk space. He should worry about that space. Because I am determined to bring home my sticks. His body can also fit into that trunk. The sticks come home. Momma is happy. I came home and looked around my home. You might not be surprised to find much of my home decor reflects my love and nature, most notably the beach. And I have not a single bunny, but for the mirror. Then my mind begins to map out how well the sticks will adhere to that round 2-D bunny mirror. Because it is dimensional, it allows for more contact of oddly shaped sticks to adhere. I divide the sticks by size and I place them, like a puzzle around the mirror. Good enough. Still oddly pieced together (like myself). It worked. And in less than half an hour, I have it! My driftwood mirror! I think it has so much more character than the bunnies. It's imperfection is perfection to me. It cost me about $7 for the clearance mirror. And for what it's worth, Big Daddy said, "I cannot beleive you made that mirror! It's really cool. It looks like something you'd buy in a store!" 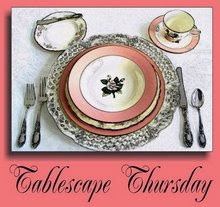 Now, onto to Tablescape Thursday, which is hosted by Susan of Between Naps on the Porch. An individual place setting this week. This is the last full week of summer as my children know it and we have stayed on the go.....no elaborate place settings, just family time, mostly consisting of paper plates and grilled burgers. But...life is good! What is a tablescape without the food? I invite you to stop by my food blog, PLATES & PLACES, tomorrow for Foodie Friday! Thanks to all of you for stopping by and participating in today's Thrifty Thursday. Please use Mr. Linky below to link up your blog. I encourage you all to spread the love and visit the other thrifty Thursday participants, for that's what half the fun is. Aside from seeing a cool treasure it's making friends! I am so in love with the driftwood mirror you created....so adorable! I love that mirror. It has so much character. I just love driftwood. What a great idea! Thanks for hosting. You did a wonderful job on the driftwood mirror! It looks like it is much more meaningful to you everytime you see it 'cause you made it AND it has memories of the beach. I have seen similar ones selling for LOTS of money. Thanks for sharing your pictures (and funny interaction with Big Daddy). Your mirror is fabulous. Great job on doing something with those sticks, lol. You know I heart driftwood..... I love that mirror! My family carries home stones. Big daddy should be happy you trinkets are lighter. Great mirror. I think you need to make more and sell them. The he will see what a good eye you have. Love that mirror. It is soooo neat! So neat that hubby likes it and comments on it. Those accolades happen so rarely that they are special. Come over and join my giveaway. LOVE the mirror - great job! Love that mirror! I never find driftwood so I am bummed. I have seen these mirrors go for a lot of money! My first time playing along! Thanks for the fun! Thanks for hosting and that's a really cute mirror. Love the use of the driftwood! This seems to be driftwood mirror week! I just featured a tutorial on Mo, then got an email with link to yet another great diftwood mirror..., and now yours -so fabulous!! !